The FootingPad composite deck post footing system is engineered to provide the fastest, most economical means to raise your deck in record time. The FootingPad system’s design is lightweight, evenly distributes deck post loads, and saves hours of back-breaking work. FootingPad can be used in most Type V construction subject to loading limits. 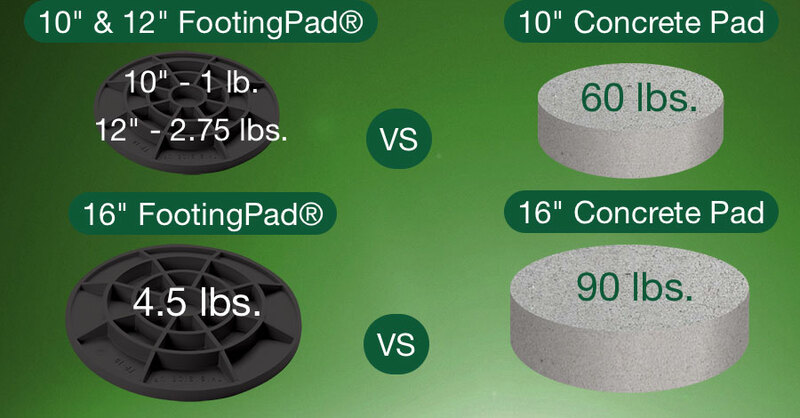 Take a look at how FootingPad compares to traditional concrete deck installation. The 10″ ~ Footing pad is ideal for raising decks. It has been tested by the NTA to replace that time consuming, messy concrete cookie. In fact, this product may hold more than untested concrete cookies. The 12″ ~ Footing pad is ideal for raising decks. It has been tested by the NTA to replace that time consuming, messy concrete cookie. In fact, this product may hold more than untested concrete cookies. The 16″ ~ Footing pad is ideal for raising large decks and pole barns. Increase crew productivity by eliminating wait time for concrete to set. The Footing Pad is fast and will save time and money. It has been tested by the NTA to replace that time consuming, messy concrete cookie. 10" Pad ~ 1lb ~ 10" x 10" x 1"
12" Pad ~ 2.75lbs ~ 12" x 12" x 1.5"
16" Pad ~ 4.5lbs ~ 16" x 16" x 1.5"
24" Pad ~ 13lbs ~ 24" x 24" x 10"